Welcome to India. After clearing immigration and custom formalities, an ATI representative will greet you and assist you to your hotel. A tour of Chennai takes you to Fort St. George and St. Mary's Church, the oldest Anglican Church east of Suez; St. Thomas Cathedral, the Mylapore Temple,\ & the Marina, the world's second longest beach. 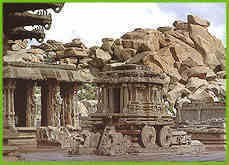 Not far from Chennai lie Mahabalipuram, "city of seven pagodas" and Kanchipuram, famous for its silk sarees. Drive to Trichy (300 kms - 6 hours), the usually popular name for Tirchirapally, located on the banks of the serene Cauvery River. This historic Chola city is a place where modernity and antiquity shakes hand. Rock Fort, the temple with a tunnel, the hundred-pillared hall, and several beautiful rock-cut temples stand as sentinels over the Cauvery. Enjoy a full day excursion to Tanjore, traditionally known as Thanjavur - a great centre for learning culture and music. Visit Sri Brahadeeswara Temple known as the Big Temple and a symbol of Chol'a architectural engineering ingenuity. Return to Trichy after lunch at Hotel Sangam. Drive to Madurai (130 kms - 4 hours), former Capital of the Pandya Kingdom. Visit the famous Meenakshi Temple, one of the most exquisite architectural masterpieces of India, the palace of Thirumalai Nayak and the Madurai Temple. 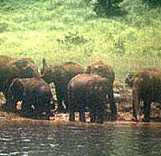 Drive to Periyar (135 kms - 4.5 hours), one of the largest wildlife reserves in India, home to wild boar, spotted deer and a large population of elephants. Over 260 species of birds are found here. Enjoy a morning boat ride on the lake to view wildlife and water birds. Thereafter drive to Kumarakom (180 kms - 4 hours) on the eastern shore of the Vembanad Lake. A day full of leisure time to relax, identify rare species of birds enjoy a boat ride along the back waters, or simply rejuvenate your body by opting for an Ayurvedic body massage. Cruise across the harbor to Allepey, sailing down centuries old backwaters flanked by picture-book towns and ancient trading ports. Then drive to Cochin, often called the "Queen of the Arabian Sea". Visit the Dutch Palace, the ancient Jewish Synagogue (except Saturdays), St. Francis church, the Matanchary Church (closed on Fridays) and see the Chinese fishing nets swaying in the breeze over the back waters. In the evening enjoy a spectacular Kathakali dance performance. Fly to Bangalore, once known as "City of Gardens", now India's Silicon Valley with corresponding increase in wealth and population. However, there is plenty of tradition and culture to explore: Art galleries, Botanical Gardens and the Lal Bagh. A luxury train ride brings you to Mysore popularly known as the "Sandalwood City". The main attraction at Mysore is the famous Maharaja's palace one of the most magnificent palace in India with huge gateways, domes, arches and sculptures. 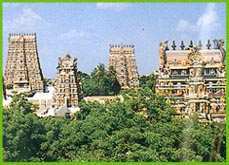 Also visit the temple at Chamundi hill, named after the royal family's pattron goddess. Enroute stands a 16-foot statue of Nandi Bull, carved out of a single huge boulder! In the evening, take an excursion to Brindaban Gardens, exquisitely designed in terraces and alive with bright flowers and silvery fountains. Enjoy a luxury train ride to Chennai where you will be received and assisted to the international airport for onward flight.